This entry was posted in Autism, Education, School and tagged Autism, autistic, Board of Education, BOE, Department of Education, Education, letter board, non-speaking, Parenting, politics, Rapid Prompting Method, RPM, school, Special Education, unintentional speech. Bookmark the permalink. Oh my goodness! I feel like we are living parallel lives! Philip also wrote a letter to his teachers yesterday which I am sharing with them today at a meeting to try to get them to use the letterboard/ RPM at school (they are finally considering it after a year). Right now he is in a special school but I am in the process of trying to transition him to a regular public middle school in the fall. Please share your findings! Good luck Lisa. New York City’s Board of Education is a labyrinthian system unto itself. Just trying to find the “start here” arrow. This is totally awesome. I would say that with her level of comprehension that I don’t really see a reason why Emma shouldn’t be able to become a member of an inclusive classroom. The theory of inclusive public education is that every child has a place in the appropriate classroom. She would definitely need a one on one aide trained for awhile in RPM. The only-possible- thing to keep in mind is that such environments are, unfortunately, really dependent on assessments (daily -in the form of homework/ weekly, yearly, what have you). Speaking from personal experience, more often than not, therse are not so much an age old measure of routine, but as an honest to God tool to measure a student’s understanding before proceeding with deeper concepts. Since Emma’s writing is still somewhat of a chore and a challenge, and it is laborious for her, this would have to be something to figure out. Could she keep up with the formal assessment and project-based work and reading assignments, and how would it get into the hands of her teachers? Also, things like reading assignments, etc. Inclusive models have modifications as far as what is expected of each child, but I think the vast majority in that model won’t place a child in an inclusion classroom if they can’t produce at least 50% of the required grade level work necessary for promotion. Yup, lots to consider. Thanks for writing all of this. WAIT! The other thing I wanted to say is that you do NOT want her placed in a standard 12:1:1 special education classroom in the city of New York. There has simply not been nearly the right amount of overhaul that needs to be done. These classrooms are not nice places, socially. Yet. Thanks so much Corbett. I am going to take a look at this. Appreciate you providing the link! by Soma, but she was working with him on RPM before she was actually certified. Have you tried a digital letter board app, like on the iPad? I don’t have personal experience with one, but I wonder how she might react to it. It may make things easier for her teachers and at the same time give her a level of independence… Maybe she would be able to seek it out and use it if she has something she needs to communicate? For school, I guess I would try to make her current situation work better first – try to work on communication between her and her teachers. I don’t know the teacher/ student ratio in her current school, but it is probably going to be worse in public school, unfortunately, which means less individual attention, and fewer opportunities to communicate. Wishing you the best of luck! Typing on the iPad and computer are our goals. We are not there yet, but will be one day. My 14 yo is always telling us school is boring! I believe it’s b/c he is beyond the ‘structured setting’ of the ‘uniform type’ of teaching. I’d love to be able to have a ‘Montessori’ type school for our children! (Montessori is a system of education for a young child that seeks to develop natural interests rather than use formal teaching methods. It also refers to Italian educator, Maria Montessori who developed a method of teaching mentally handicapped children and advocated a child-centered approach) Therefore, a Montessori type base educational program that allows our children to learn on their individual educational level, where they are able to feel proud and successful !! I do not feel our children are ‘handicapped’ they are not necessarily ‘special needs’ ~ Our children are ‘little professors’ who need guidance and instruction in how to release their ‘individual intelligence’. And be allowed to express their individual insight of what they know is the best way for them to learn! I think it depends what you term by special needs. . . . .little professors need just as much special attention as those who struggle with aspects of school…. Just in a different way. It is still a special need if they are going to be taught effectively. Special schools don’t really exist here, Ithink there might still be one in operation but it is not autism specific. Ethan will most likely go to regular public school with an aide. The thought scares me to death and I really should be doing the same as you and preparing and learning laws and rights so when the time does come I am able to get him what he needs. The only upside is he will have a big brother at school for the first couple years so maybe that will help some. Wow! Emma continues to blow my mind with every post. This particular post brought so many emotions. I am elated that Emma can share her needs and desires for learning. I am appalled that schools won’t actively seek out alternative training for staff to help kids to learn and communicate in a way that makes sense to them. I am ashamed to be a special education teacher, knowing the system is so very flawed but yet not being able to change things. It disgusts me the way some staff and adminstration treat our kids. I am very hopeful that things can change. I am so inspired by Emma and many others who are speaking out. They are forcing me to take responsibility to make these changes happen. They are waking my mind to these “new” techniques. My son is 6, he also has a form of intractable epilepsy that causes him to have drop attacks. For this reason he is enrolled in an aba based center. I am not thrilled with aba but I am less thrilled with the public school. Right now it is the safest place for him to be because of his seizures. He has someone with him 1 on 1 at all times throughout the day. They are more open to actual education than most aba programs I’ve encountered. It is not ideal but it is currently what is best for his safety with these nasty seizures. BUT reading Emma’s words encourages me that changes can be made if we listen, do and share.. Listen, do and share that is what keeps running through my head. I will listen to the experts (Emma, Ido, Ibby, Amy, Larry etc etc). I will do whatever I can in my power to understand and learn. I will share my knowledge with everyone, everywhere. Thank you again Emma for helping me understand. Thank you for inspiring me. (((Kari))) And one day your son will be able to tell you himself! Wow, she sounds like Carly Fleischmann! This is very uplifting. Would Emma ever agree to demonstrate via video the way she does this? A couple of people have asked this and I will ask her… we have tons of footage of her writing this way. We don’t have a special school, but my sons school has a ‘progress’ teacher. His role is very varied, depending what kids need at the time. Zack spent the first few years doing most of his educational type work in this setting, one on one with the teacher. He went back to his regular class for music, singing, swimming and those sort of sessions. We discussed having an aide but the school has not found it necessary so far. I think the best thing we personally did was ignore the psychologist who said he would not cope with regular school and went with ” lets see how we get on”. Admittedly, lots of OT and other home programmes which where possible we implemented during progress class time as well as at home. Zack continually amazes us with what he achieves at school, and the school thankfully respond in an equally positive manner. Its amazing what can be achieved with the motivation of… Special schooling = home school or a residential school in another country!! we did do Montessori for preschool which was a very good way to get started with education…… They didn’t even mind that he was completely non verbal then. My daughter is in a mainstream school/class, and it made me nervous at first, thinking she would get lost in the shuffle. She has an aide, and we meet every few months to discuss her IEP goals. She started out communicating with cards I drew for home and school, and has progressed since to not needing them and verbalizing one or two words to get the message across. They include her in as much as she wants to participate in, and when its too much, they ease off. Her teachers are wonderful and open to suggestions I give on how to teach her, but are limited to only knowing how to teach neurotypical kids, her aide has good instincts but has not been trained in autism other than a little floortime. She does love school though, and the kids are all wonderful with her. She’s going on 6 now and spelling, reading and starting to write with wrist support. I think a good IEP and open communication is the key to success. I’m in Canada, so it may be different, we really had no choice but to put her in mainstream school, and there are no special classes, its all inclusive now. Everything here went mainstream about 10 years ago I think. Ariane, the problem with the way our schools try and do Inclusive Education isn’t that one size can’t fit all, its that we try and fit all into one size. We built an education system that only considers nondisabled students and say that disabled students can exist in it as long as the system doesn’t have to change for them. well there is nothing inclusive about that. Forced assimilation is oppression. Inclusive education is about acceptance and accommodation and it takes each student as they are and works toward their learning style so kids like Emma don’t have to write letters asking their teachers to actually teach them. I would like to pick your brain sometime if you’re willing gregg..I still have a year before the transition/iep mtg for kindergarten but despite having a general knowledge I really have no clue as to the practical side of what I’m doing aside from needing a general1:1 or 1:2 aide who can facilitate his use of his AAC and help him participate…but do I pick them does the school? How can testing be modified? How much therapy can I push for. Things like that. I read so often of parents being steamrolled by the schools because they simply don’t know any better and my son deserves for me not to be that parent. The school gets to pick who generally, but to make your case for supports and services, you need to show that these services/supports make it the least restrictive environment appropriate. Appropriate is the word that either you will use successfully or it will be used against you. The other thing to keep in mind is that while many states commit to excellence in education, the courts have not held them to the same standard for disabled students. Schools and districts are only required to provide educational benefit not to maximize it. Gregg – Yes PLEASE!! Any help would be so appreciated! I am going to DM you on Facebook. I read this somewhere, if a child cant learn, then we need to change the way we teach so he can. shouldnt Emma go to a school for gifted children? she’d be bored out of her mind in regular school. also, there’s the problem of bullying, both by classmates and teachers. Emma said something out loud. she can talk. and her vocabulary might improve with age, as is the case many time with children on the spectrum. what is interesting is that both Emma’s right and left side of the brain are developed. she likes writing stories and likes poetry, but she finds math fun and easy, so easy that it’s boring. although when she writes those stories i read in recent posts, she writes way above and beyond her age. usually, if the left side is developed, the right isnt and the other way around. a person who’s great in math usually finds it difficult to write a story. Emma is blessed and gifted. I would also second Ib’s caution that a regular school may be boring and problematic for…other reasons. Generalized chaos was a huge problem when I was in elementary and middle school. It is awesome that Emma expressed her thoughts on scooling and her wishes so well. It may be a good idea to approach different schools directly and talk to them. Possible ideal situation could be part time attendance. Good luck! This is a truly inspirational story. I commend you as parents for being wonderful advocates for your daughter. This is so important. 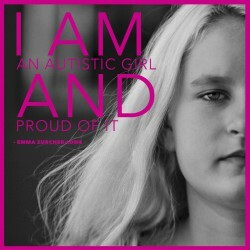 Emma is an inspiration. Having worked in Specialized NYC public schools that specifically work with a population that is predominantly Autism grades K-12, I can relate to your feelings. However, as a special education educator, I also see the other aspect of this discussion which is that in working in special education; it is not necessarily the teachers who are not open to new methods. Instead, the resources and training are limited for furthering the understanding of how to approach teaching children with autism. Particularly, because no two special needs children with autism are exactly alike. Have you proposed attending the school as a parent or having your home therapist shadow Emma in school to work on a collaborative individualized plan for her in school? The movement in special education with the New Special Ed reform movement is toward the least restrictive environment. However, as a school they would be remiss in their professional responsibilities to Emma if they did not ensure that Emma is in a position to maximize her level of independence when moving to a Gen Ed classroom. Even with supports like a 1:1 para, it would be preferable for Emma to be able to first be able to use a communication device or.method that facilitates and promotes her own independence in communicating with not only her teachers but also her peers. Especially, when you consider the social dynamics of a classroom of young adolescents and the social pressures that are on children in that setting. Thus please remember that she should be challenged academically in any setting. However, before being transitioned into a mainstream Gen Ed classroom; this is a very different setting and offers far less support overall for students with special needs. Most Gen Ed teachers are not at all familiar with the use of programmatic devices and alternative methods of teaching children with autism. Particularly, because in the current system STATE WIDE, it is still uncharted territory for many licensing and certification requirements. Most Education Special Ed Grad programs do not even cover this topic or gleam over it briefly. 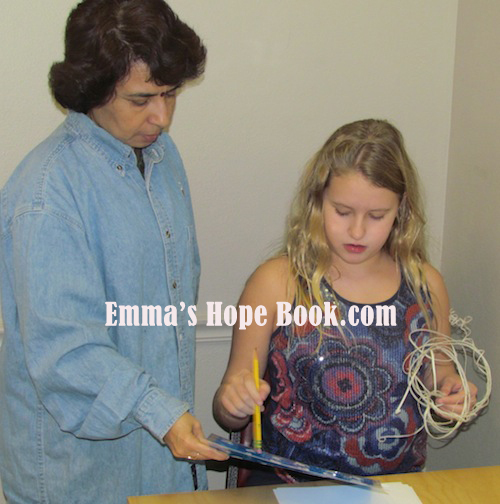 For Emma, communication with computer based technology, IPads, other assisted communication devices that afford independence with her teachers and peers will make her less isolated academically and socially. In an ideal world, this would not matter. However, we are not living in an ideal world – Yet! I wish you and your family much luck !! You have done a wonderful thing here! I commend you! Thanks so much Pauline. Appreciate your thoughts on the subject. How did her teachers react? Her school is uniformly positive and extremely supportive and encouraging. We will see how things progress, but as things stand at the moment, we could not have asked for a more positive and hopeful response!